Light Of Faith has several spiritual elements that I would like to share with you. The dramatic sky is a representation of heaven. It is almost as if the sky is inviting you into Heaven. The main light source in the painting is hidden behind the clouds. We don't see Jesus' face right now, but we see His creation, His love, and His light. On earth, we must have faith and believe in Him without seeing him. 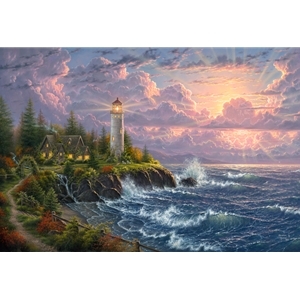 At the same time, I wanted the lighthouse to represent our guidance from the Spirit on our journey through life. His light keeps us from the rocks, gives us light in the storm, and gives us a beautiful place close to Him to call home. My prayer is that this image will give much inspiration to many. It has given me great fulfillment in my purpose as an artist. It is my desire that this painting greatly blesses you, straight from my heart to yours. Thank you for letting me share Light Of Faith with you.